2018 brings a new process for registering players. All Ohio South Youth Soccer Association teams are participating in a national registration system through US Youth Soccer. The registration software is not managed by FC United, however we do have access to make changes if needed. Cropped photo of all players you plan to register. Please use www.photoresizer.com or www.picresize.com to crop image to 300w X 400h pixels of players face. Digital copy of birth certificate for all players you plan to register. Note: after uploading image and cropping image location, Under Step 2 "Resize Your Picture" select "Custom Image" under "Make My Picture" dropdown. Click here to register your player(s). 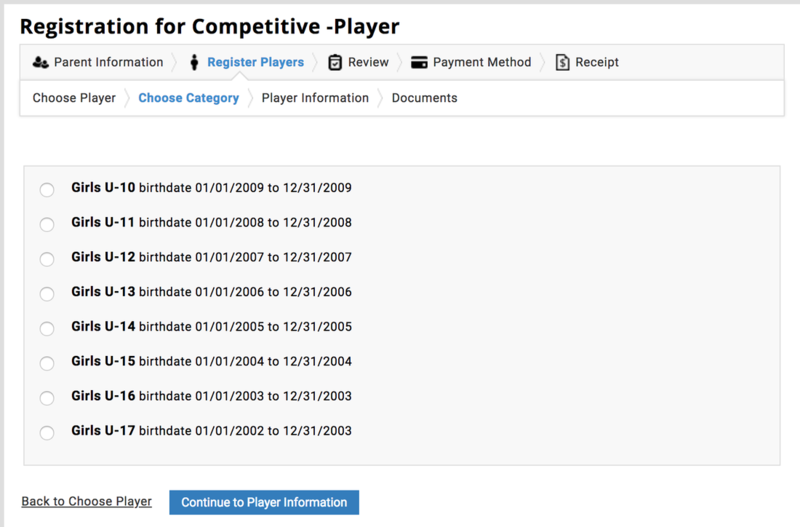 After entering Parent Information, under "Choose Category" option please select the birth year of your player. See image below. Our admin will manually assign players to their teams after you register. During registration you will see a PAYMENT METHOD step. FC United is not collecting any funds through this system. This step does not collect any payment details such as credit card or bank info and is just a step that you have to click through.